There’s a strong sense of déjà vu hanging over the cozy bricks-and-boards thrust at Classic Stage Company right now, and not in a good way. It’s a wonderful setting — intimate without feeling cramped, textured and a little gritty but still spare and elegant — and it’s just right for the kind of democratic, fourth-wall-breaking, we’re-all-in-this-together vibe that’s often distinguishes stripped-down stagings of the kinds of plays from which the theater takes its name. But artistic director John Doyle, who directed a killer Arturo Ui last fall, seems to be approaching his current production by rote. It’s a plodding revival of Marc Blitzstein’s 1937 music-play The Cradle Will Rock, and it finds the director retreading much of the ground covered by Ui but with none of Ui’s ferocity or flair. There’s a fine line between a distinctive directorial signature and a bag of tricks, and with The Cradle Will Rock —already a blunt instrument of agitprop that requires lots of sharpening if it’s really going to sing or sting — Doyle seems, more than anything else, to be tired, resorting to his tool belt without honing the tools. Cradle emerged from the Federal Theatre Project under the WPA — that mythical moment when the U.S. government decided to fund things like art during a crippling economic downturn. It’s a piece where the context is as interesting as — maybe more interesting than — the play itself, which explains Tim Robbins’s 1999 fictionalized making-of movie and an earlier film attempt by Orson Welles, who directed the first stage production, to revisit the story of his process. The original is a heavy-handed pro-union parable set in “Steeltown, USA,” a Brechtian almost-opera in which characters with names like Larry Foreman (the steelworks foreman and union leader) and Harry Druggist (the … druggist) are pitted against the evil tycoon Mr. Mister and his cultural cronies, Editor Daily of the daily paper, Reverend Salvation of the local church, and President Prexy of the city university. Most of the story (what there is of it) unfolds in a series of vignettes inside a prison: Moll (Lara Pulver) has been locked up for solicitation — “but really because that flatfoot couldn’t make me say yes” — and as she sits in the clink, Harry (Tony Yazbeck, who also plays the heroic Larry), now a vagrant who’s lost his store and his son to Mr. Mister’s machinations, gives her the rundown on how the big man went about putting the town in his pocket. It’s a predictable merry-go-round of bribery and corruption, and Doyle’s actors spend a lot of time hungrily pawing at dollar bills as they flutter to the floor. The problem with too frequent an application of the adjective “Brechtian” is that, while it might accurately call to mind a certain aesthetic, it doesn’t necessarily bring along with it any of that writer’s distinctive brilliance. Nudgy-winky names and social commentary aside, Blitzstein was no Brecht, and especially in the wake of Arturo Ui, The Cradle Will Rock comes off as wooden and ineffectually hammy. It’s got a point to make — over and over again — but no sparkle, no true wit, and, here, not even much sense of playfulness. Doyle, who also designed the set, keeps the production characteristically spare — there’s a piano, an electrical pole overcrowded with wires, and a fleet of salvage drums that serve any and all staging purposes — and Ann Hould-Ward dresses the ensemble in dingy factory attire, with almost no changes to designate shifts in character or class. And while it feels right to stay scrappy with a play like Cradle, Doyle’s use of his purposefully limited aesthetic vocabulary here seems mechanical rather than ingenious. We’re never surprised, either by Blitzstein’s tale or by Doyle’s use of the scenic world to tell it. When Sally Ann Triplett and David Garrison embody the rapacious Mister couple — along with Eddie Cooper and Kara Mikula as their Roald Dahl–esque spoiled brats — the missed opportunities feel especially palpable. If this is a kind of people’s parody of wealth and privilege, why not go further with the acerbic, handmade pageantry of it? The show’s best moments contain a hint of this kind of winking, ragtag spirit, as when Mikula — who’s fun to watch throughout — executes a wacky ballet as a macho, welding-mask-wearing football coach. Sadly, Yazbeck never gets to dance, and he seems a little stranded in his dual roles of the broken Harry and the incorruptible Larry. 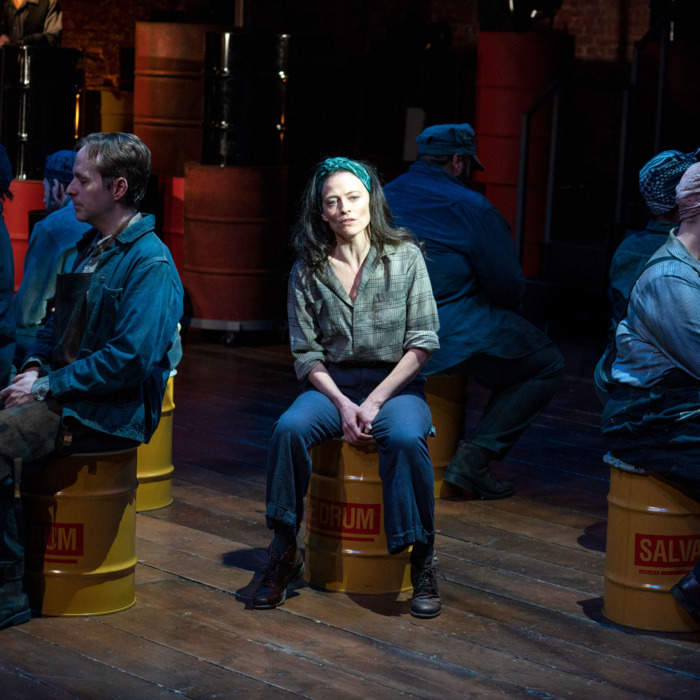 Pulver has a strong voice and a sharp, waify appeal as Moll, though she has to spend most of the play sitting and listening, and Rema Webb sounds full and resonant as Ella Hammer, who brings the show to what should be its emotional climax with “Joe Worker,” an anthem of suffering anger in the face of oppression by the bosses. But while Webb delivers it well, the song itself falls flat, as does the driving, optimistic title number. There’s something deflated under the defiance, something a little weird and a little sad in listening to an earnest-as-apple-pie song from 1937 about how “there’s a storm that’s going to last until / The final wind blows, and when the wind blows / The cradle” — that would be the cozy, elevated enclave of the one percent — “will rock.” I’d love to believe it, but this century’s cradle is hung higher than ever and doing just fine. Not that a single play is obligated, or even able, to rock it, and not that a play’s worth should be determined by a simplistic debate over whether or not it’s capable of sparking social change — but the cradle aside, plays do need to rock us, and this one leaves its audience right where it found them. The Cradle Will Rock is at Classic Stage Company through May 19.